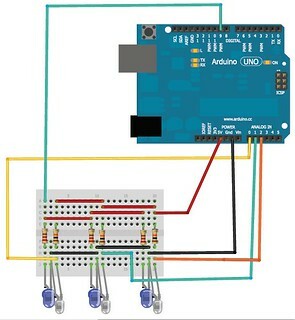 There are two ways of making a line sensing/following robot, using a light dependent resistor(LDR) or Infrared(IR) LED. The fundamental logic behind a line sensing robot is that, a dark object reflects less light than a bright object, or we can also say, a dark object absorbs more light than a bright object. So, in a line following robot, we basically build a sensor that can detect the difference between a dark and a bright object, or say, a black line and a white surface. Before you fix the sensors onto your robot, you need to see if the sensors are really reflecting less light on black line and more light on white surface. Resistors connected to White LEDs: 220Ohm. 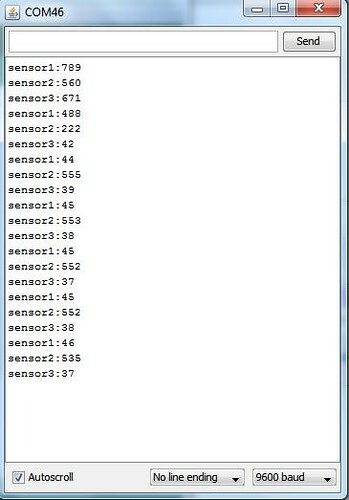 You can get the source code for testing your sensors at the end of this post. 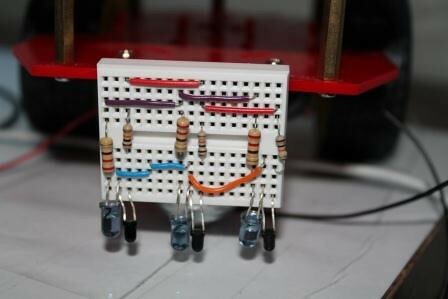 For this circuit arrangement, remember that the LDRs should be slightly above the LEDs so that they get right level of reflection. If you put LDRs below the LEDs, they will be illuminated with LED light. Resistors connected to photo diode: 10k. 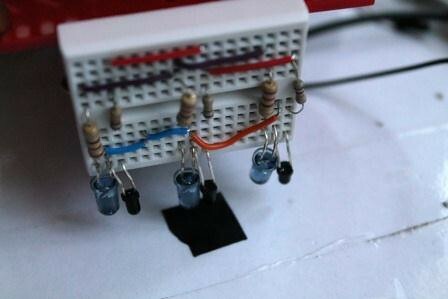 In this circuit also, keep the photodiodes or phototransistors just above the infrared LEDs. The blue LEDs are all infrared LEDs and the gray ones are photodiodes. How to connect a photo diode? A photo diode has two terminals, one is anode and the other is cathode. Photo diodes are often connected in reverse biased mode, wikipedia says so, CHECK IT HERE. Therefore, connect the longer terminal(anode) to GND and shorter terminal(cathode) to 10k. I have found a schematic on sparkfun.com. 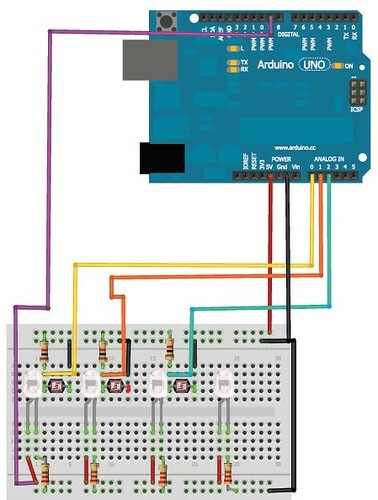 It is the schematic of QRE1113 line sensing module. I adopted the same circuit for my robot also. The only difference is that the QRE1113 line sensing module has both transmitter and receiver on the same casing. If you have never worked with a photo diode, follow this link: PHOTO DIODE PROJECTS. I found that the LDR and IR based sensors can clearly detect the difference between a black line and non-black surface. You can see the results on serial monitor, out of three sensors, the sensor right above the black line gives more values than other two. When you test your sensor, you can just use a small black tape or a use a black marker/color and color on a white surface. – Keep your sensors just 5-7mm above the surface. After you test your sensors, you are ready to make the robot. Download Fritzing file- For IR circuit. Download Fritzing File- For LDR circuit. ..thank you for your help for our project..
Hi I’m trying to test my sensor but when I run the code nothing happens. Like no window pops up or anything.